Edinburgh winger Darcy Graham has committed his immediate future to the capital club after agreeing a new deal stretching to the summer of 2021. The 21-year-old has enjoyed a breakthrough season under Richard Cockerill at Murrayfield, contributing seven tries from 12 appearances this term. 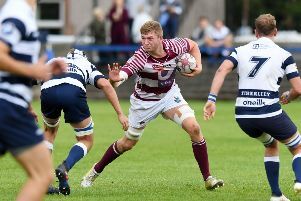 The Hawick flyer was rewarded for his form earlier this season when Scotland coach Gregor Townsend called him up for his international debut against Wales in November. Now he is eyeing up more success with his club side, saying: “I’m absolutely buzzing to be staying at Edinburgh for the next two years. “The club is building towards something very special, on and off the field, and I can’t wait to be a part of it moving forward. “I’ve grown up watching Edinburgh and I never thought in my wildest dreams that I’d be going into my third season with the club. Cockerill added: “Darcy is a really important part of this team, so I’m delighted that he has chosen to commit his immediate future to Edinburgh. “His attitude and hard-work ethic are an example to anyone looking to make a name for themselves in the modern professional game.